The Higgs discovery seen from within INSPIRE: one year on. 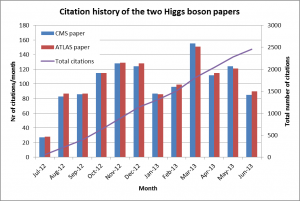 Exactly one year ago, on July 4th 2012, ATLAS and CMS presented evidence for a new particle behaving like the long-sought-after Higgs boson. By the end of the month, two papers from ATLAS and CMS were published describing this discovery. Unsurprisingly, they rapidly accumulated an enormous number of more than 1000 citations in less than a year. Below is a graph of the distribution of the citations that the two papers have gathered until now. These counts include an INSPIRE ‘speciality’: we take into account the references to both version of a work: the published article and the arXiv preprint. To look at this in context: among the million records in INSPIRE, only 512 papers so far have passed the 1000 citations mark. Of course, several of those describe major discoveries, such as the W and Z bosons, the top quark, and the ‘November revolution’ J/psi meson papers. In their first year, the articles announcing the W and Z boson discoveries received a total of over 600 citations, while the two ‘November Revolution’ papers (BNL and SLAC) collected a total of around 1100 citations. 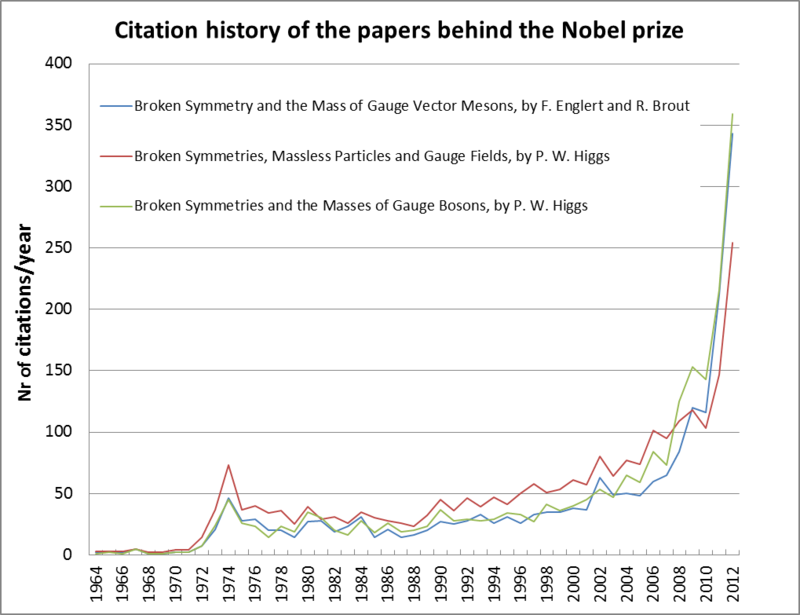 The top quark discovery papers by Fermilab gathered a total of 1200 citations in one year. 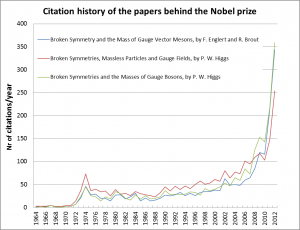 For comparison, the highest-cited paper ever is Maldacena’s famous paper on the connection between string theory and quantum field theory, now closing in on 10,000 citations. It received just under 500 citations in its first year.